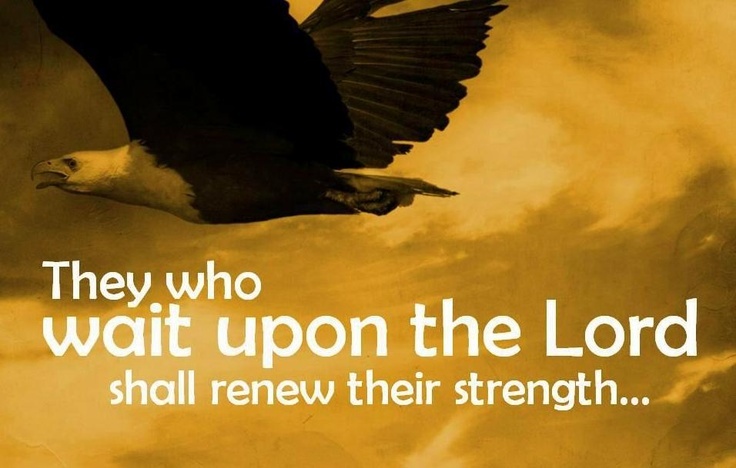 Your strength is renewable in Me as you wait upon Me, says the LORD. Waiting is not worrying. Waiting is not working things out on your own. Waiting is not wailing. Waiting is not being stressed out. Waiting is not trusting in what you can do, what you can see, what others can do or what resources that you have. As you wait on Me, I will strengthen and help you. I will lead and guide you. I will open doors for you that NO MAN can open. I will provide miraculously for you. I will make a way where there is no way. I WILL DO A NEW THING that is mind boggling. I love to create. I love to surprise you. I love to do the unexpected. LET ME WORK IT OUT in MY superior Way with My inexhaustible power and resources, says the LORD. Becoming weary and weak and exhausted and burned out is NOT MY idea of abundant life for you. I did not overload you. I asked you to shift all of your burdens upon Me and hook up to My easy yoke and light burden. I AM NOT stressing you! I Am the strength of your heart and the strength of your life. I will renew YOU and strengthen you continually as you wait, wait, wait patiently upon Me. LET ME DO IT! Let Me work MY WORK in you. Let ME work through you. Let Me work things out for you and those that you love. For My strength is made perfect and complete in weakness. Then I will get the glory for not only giving you new strength, but doing what you could never do without Me, says the LORD.